The Office for Inclusion and Intercultural Initiatives provides training and education designed to encourage and promote an inclusive and welcoming campus. The office works with colleges and academic units, administrative departments, and others to develop and present workshops, seminars, and other programs for faculty, staff, and students. Small group workshops, large presentations, and other training on anti-bias, microaggressions, inclusive classrooms, and other topics. The need for dialogue across difference is an essential life skill. 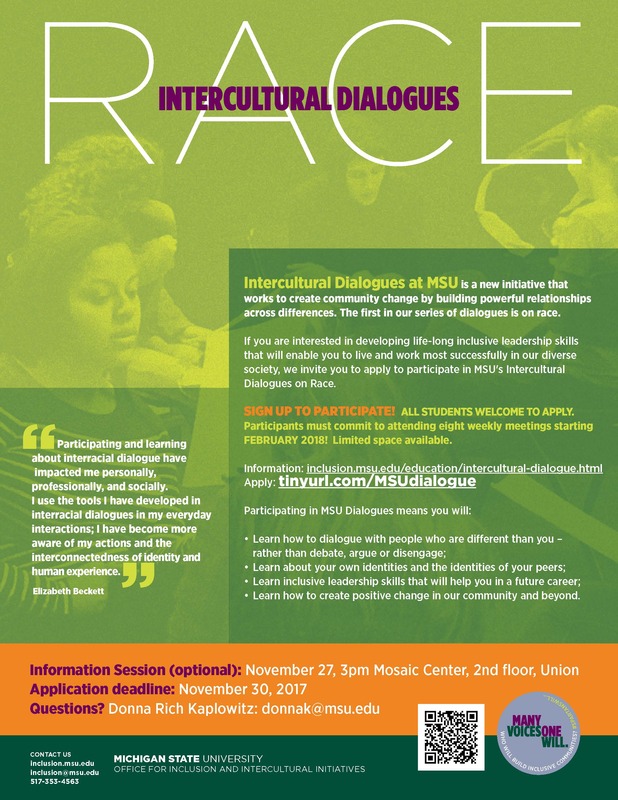 MSU Intercultural Dialogues positions us to be local and national leaders in using a dialogic approach to strengthen our civil society and academic community. We all play a role in MSU's ambition to achieve excellence through full participation, and this program will give you the tools to make a difference. Training and strategies for faculty on managing the climate in the classroom during the current presidential campaign. Designed to introduce incoming students to MSU's core value of inclusion. Held monthly during the academic year, these informal seminars address topics related to inclusion, social justice, and equity. Uses theatrical sketches to provide an interactive learning experience that engages audiences in collaborative problem solving. Being aware and mindful of our language, both written and oral, can help create a supportive and inclusive climate. MSU has long had a policy to permit students, faculty/academic staff, and support staff to observe those holidays set aside by their chosen religious faith. The Office for Inclusion and Intercultural Initiatives partners with experts from across campus on diversity and inclusion education efforts.